I love collecting charm square packets and often will pick them up at quilt shows or quilt shops when I don't have a shopping list of fabric I actually need! These little 5" pre-cut squares are a real time saver if you need a quilt done quickly. Here's a quick little pattern for you that uses these charm squares. I started with 2 packs of charm squares of the same fabric line, but you can use coordinating fabric lines, squares cut from your own fabric scraps or from yardage of your favourite fabrics. The white strips between the charm squares are cut 2.5" x 5". Lay out your squares in a pleasing arrangement - on a design wall where you can step back and look at it overall, or on the floor or bed if you don't have a design wall. Each charm square pack had 42 squares in it, so I did my layout with 7 square per row and a total of 12 rows. The final quilt measures 43" x 52" - a great size for a lap quilt on the sofa! Sew your rows together - odd numbered rows will have a charm square on the left and end with a white strip on the right. Even numbered rows will start with a white strip on the left and end with a charm square on the right. Next, sew your rows together. You will want to line up the center of the white strips with the center of the charm squares in the row below. I just usually eye-ball it and sew without pinning, but if you are particular about things lining up perfectly, you will want to measure and pin those centers together. Other than that, there is no matching up of seams, making this a great quilt for a beginning quilter. The outside edges of the quilt will NOT line up - you will trim them after your rows are all pieced together. When your rows are sewn together, you will have trim the bits of the charm squares that are sticking out on the edges of the quilt. You can add a border at this point or just leave the quilt top as is like I've done. 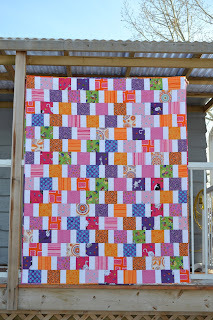 Quilt as desired - this quilt lends itself to quilting in straight lines as I've done on this one I did for my grand-daughter or in an all-over pattern as I had my long-arm quilter do for me on this Christmas charm quilt. Equally nice from the back! 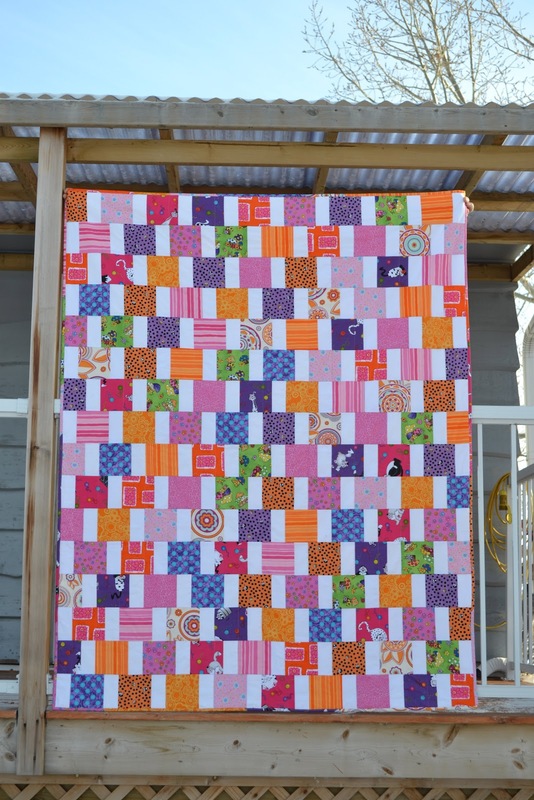 Make this quilt as large as you like! It's definitely a quick and easy one and the abundance of choices for charm square packs make the choosing of colors for your quilt equally easy!